Community Partnerships with B Lab represent a way to support B Lab as well as work with our B Corps to create a positive impact on the world and generate a shared and durable prosperity for all. - enable B Corporations and purpose-driven companies through leading, facilitating or supporting systems change towards the New Economy and help B Corps navigate the new economic system. - create a powerful network that is connected, enjoys beneficial relationships and are self-organising. We are thrilled to announce that Beyond Bank Australia have come on board as B Lab’s first Community Partner. We will be working closely with the team at Beyond Bank to seize on all the momentum we’ve built and grow and accelerate the movement. At the end of our first year of partnership, we have worked together to deliver a case study on Beyond Bank which we hope shines a light on the leadership role Beyond Bank has assumed. "B Lab is really proud of its community partnership with Beyond Bank Australia. The partnership has provided a significant opportunity to capture and understand how BBA is using B Corp as a force for good in its everyday operations. 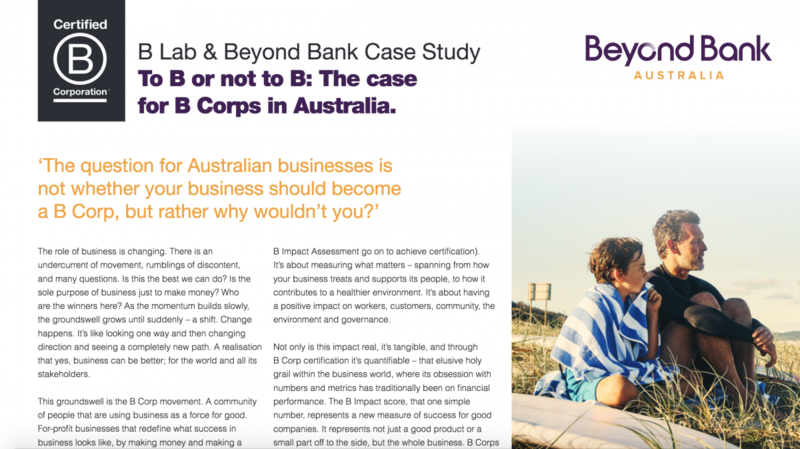 We hope that this case study can provide both inspiration and practical ideas about embedding impact post certification and serve as a valuable resource for our community and potential B Corps"
To learn more, download the case study here.